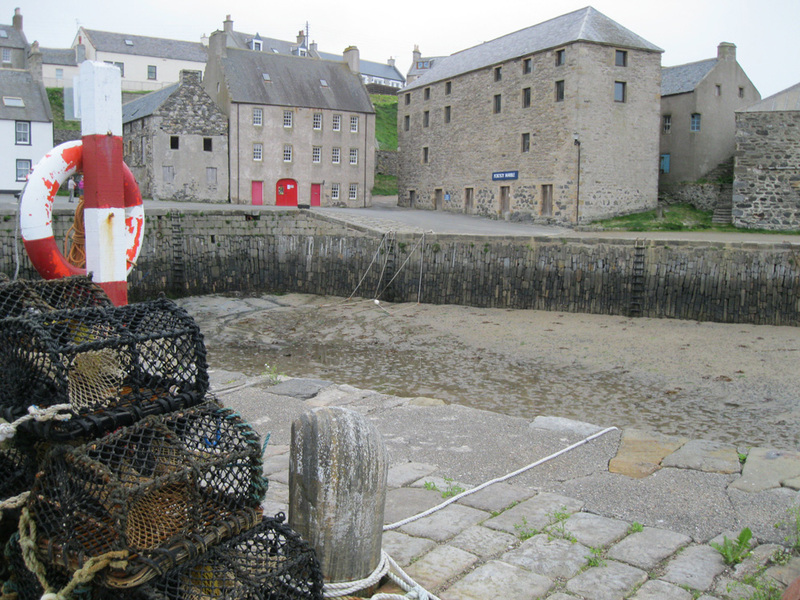 Portsoy has both old and new harbours. Sir Patrick Ogilvie the 8th Earl of Boyndie, decided that the first harbour should be built and it was completed in 1693. The new harbour was constructed in 1825 due to ever increasing demand from the herring fishing fleet. The 19th century herring boom brought further prosperity to Portsoy. At its peak, the herring fleet totalled 57 boats. The harbour was washed away in an extremely violent storm in 1828 and it took until 1884 for the harbour to be rebuilt. At one time a railway line ran down to the older harbour which maintained a busy commercial trade, particularly in coal. Towards the end of the 19th century the Portsoy fishing fleet moved to the larger harbours of Macduff and Buckie and today Portsoy's harbours are primarily used by pleasure craft and creel boats catching lobster and crab. The original harbour has taken on a new role as the venue for the annual traditional boat festival held every summer. The harbour extends to 3,800 sq. metres with 200 metres of quay and is protected from the north-west gales by the headland and north pier. The new harbour, though more exposed, is the larger and berths up to 30 boats and a slipway is available at the east end of this basin. The users comprise of a mixture of shell fishers and pleasure craft which blend in with the unspoiled area around both harbours. The new harbour dries out at low water springs and access to the sea is impossible from most parts at low tide. Contact with the Harbourmaster is advised for access. During neap tides movement by shallow drafted boats is possible at most times.